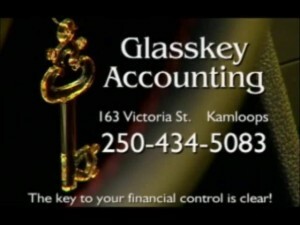 Welcome to our Accounting / Financial / Bookkeeping / Consulting Services in Kamloops BC corporate website, please feel free to visit our resources and comment back to us we appreciate your feedback. Glasskey Accounting & Associates was established in 1993 and has been providing quality non certified engagement services to the Kamloops community and area since. We have a great deal of experience working with a large rate of industries and and small business. We specialize in customized service and support for your business, we go the extra mile in educating our clientele to efficient business run models. Our staff are formally trained and are required to provide the strictest quality controls on the information that is provided back to our clientele and or filed on their behalf. We have been in operations in excess of 20 years and provide a vast level of knowledge and experience. We pride ourselves in our customer feedback being positive and our retention rates are high. We always welcome new clientele and look forward to positive working relationships.